New Years Resolution: Ski More Powder! 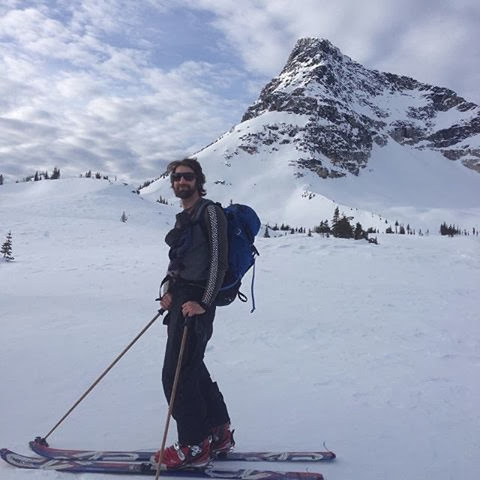 I just returned for a weeklong trip to British Columbia in search of that white stuff that has eluded the Sierra Nevada Mountains so far this ski season. I was determined to take action in 2014 so I started hatching plans, sending out texts, and found a willing and awesome partner in my friend Lizet. We scoured the forecasts and it seemed like the most sure bet was Revelstoke, BC, a sleepy town that comes alive in the winter with bountiful snow, a resort that towers with vertical, numerous catskiing and heliskiing operations, and famously beautiful backcountry. 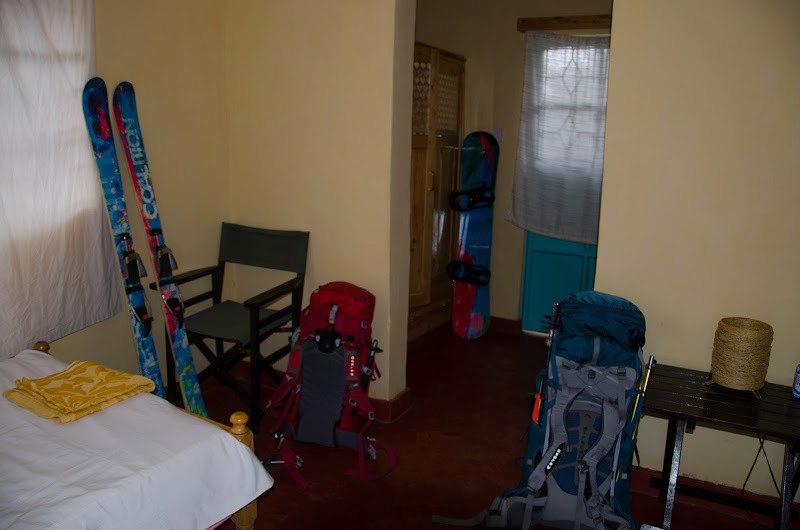 We also have some friends there, which makes sleeping and getting a local’s tour of the ski possibilities easy. So, we met up in Reno on January 1st and flew to Seattle, since we both had free flights and made the 6 hour drive to Revelstoke after a bite to eat in Seattle and stocking up on groceries and gas in the USA. It was snowing as we drove east and when we showed up in Revelstoke, snow piles were over 10 feet tall at every driveway. We woke up the next morning to snow falling steadily from the sky and got on the hill at the leisurely time of 10:30 AM – we knew we needed sleep to start the trip off right. I also knew my legs wouldn’t last all day. We were lucky that our friend Stephane had a day off to show us around. 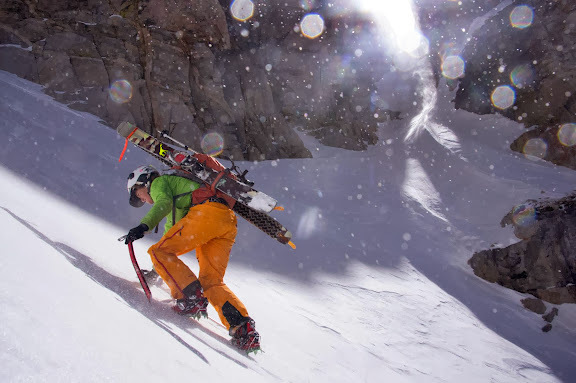 He is an awesome telemark skier that heads up Tough Guy Productions. He showed us all the goods that day and we both knew we had our best turns of the year. It snowed all day and so the next day would be a legitimate powder day. Lizet and I are just a little bit pumped about the snow! We awoke early knowing we needed to get to the hill prior to the 8:30 opening. Much to my chagrin, when we arrived, there was a huge line for tickets. Stephane and Lizet got in line for the gondola while I waited to buy a ticket. I watched the line grow and grow. Even though the mountain itself is huge, it only has 3 lifts – the main gondola from the base, the Stoke Chair to the top, and the Ripper Chair for some additional terrain. This may have been the most skiers they’d ever seen in one day. I got my ticket at 8:40 and ran to try to find them in line catching them 10 people before it would’ve been too late. 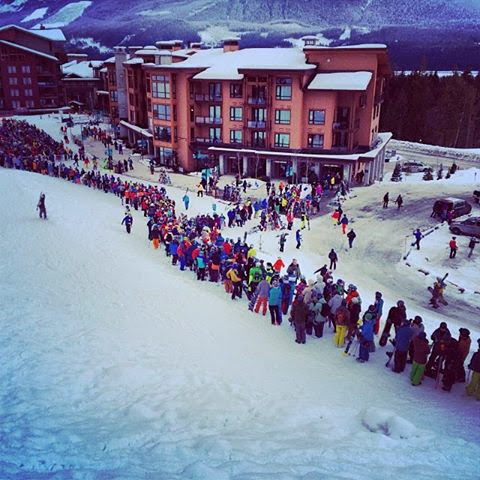 I was relieved to have a posse to shred with and to avoid the 2 hour line. The powder day line up at the base of Revelstoke. Photo by Lynsey Dyer. We skied all day – tight trees, pillows, more open trees. The visibility up top wasn’t great, but the snow made up for it. Our final two runs, slightly out of bounds were my best runs of the year and I returned home with crushed legs and a huge smile. 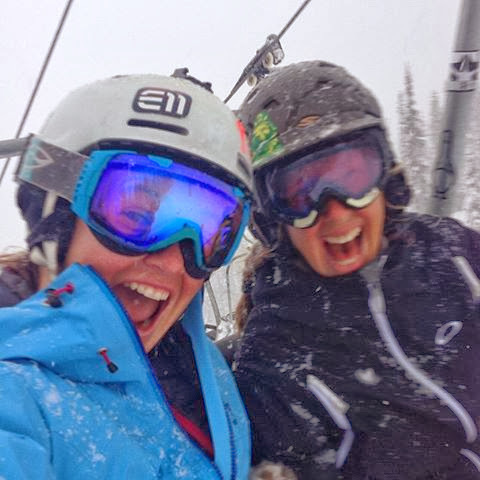 The next day we decided to explore more of the Revelstoke Mountain sidecountry since it was clearing up – we were able to ski more powder, see more of the options for out of bounds skiing, and even make Allie’s yoga class for some leg restoration at 4pm. After yoga we were able to meet up with some other friends in town and meet some really fun locals. My legs were turning the corner and I was starting to feel more and more at home in this town. 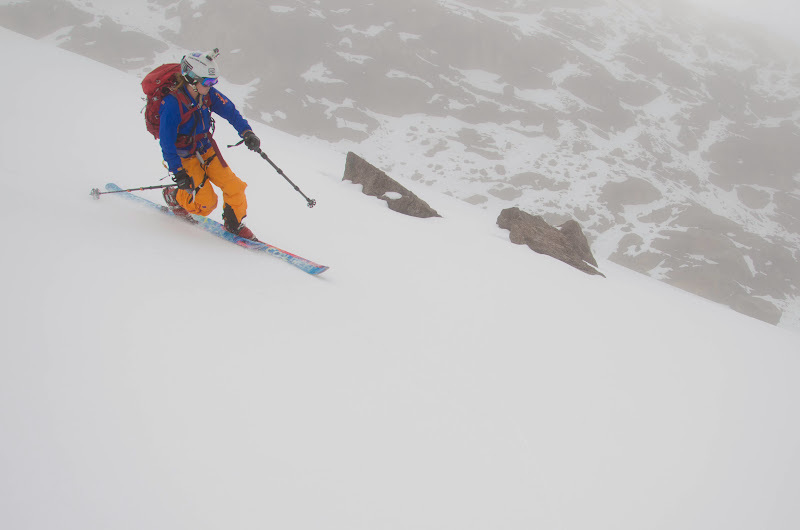 On the fourth day, I had made plans to ski with Anne Keller from Alpine Finishing School. It was an all-female crew including Kellie, Kim, and Lizet. Anne literally took us all to our best run of the season. It is a 4,000 foot climb, but the snow was perfect the whole way and the views were even better. The run down was full of pillows and open lines – everyone was smiling at the end and wishing we had time to do a second lap. 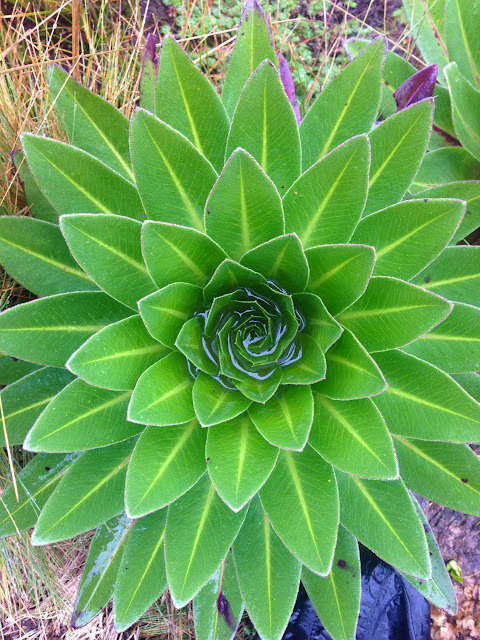 If you’re up in Revelstoke, look Anne Keller up. She works for Selkirk Tangiers and will take you to good skiing! Anne pointing out some of the nearby peaks. Photo by Lizet. Stunning views on this tour. 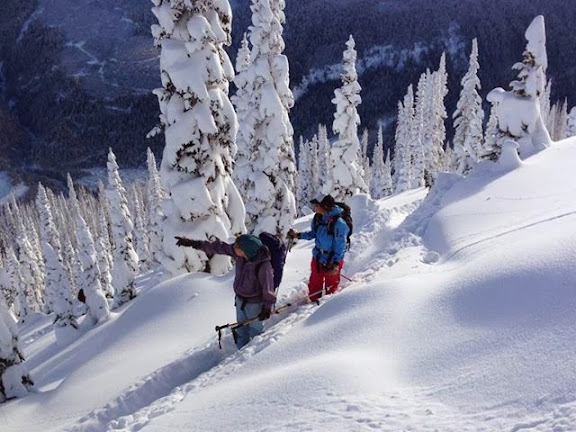 On the 5th and final day in Revelstoke, I headed out with our friend Rory to ski Mt. Begbie – the mountain most visible from Revelstoke and one that the local brews were named after. 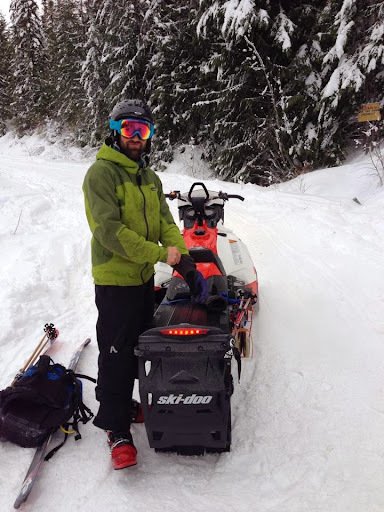 We used Rory’s sled to climb 4,000 ft and then skinned an additional 3,000 into the alpine. The snow was a bit wind-affected on our first run, but on the 2nd we nailed the right aspect and it was great skiing. The bonus was skiing all the way back down to the car. Some was on a snomo track, but there were occasional powder cutoffs. Rory readies his trusty stead. Up in the alpine with the summit of Begbie behind Rory. After a change of clothes and rallying the troops, we headed to a Revelstoke establishment The Village Idiot with twelve of our friends for some food and beers. We even ran into new friends we made. It seemed harder and harder to ever leave this place! By the way, do not miss the Village Idiot if you go to Revelstoke. The food is delicious – not bar food, just good food. The scene is classic mountain town bar without a corporate influence. I wish there was something like that in every ski town. The views from the peak to peak – a true engineering marvel (but also somewhat disturbing). Find a local and have them show you around on day 1 – it will be worth it! Get Revelstoke tickets at Costco in Vernon, BC or Bellingham. The Stoke List – a craigslist for Revelstoke, but better. 2 awesome people we met run this site. 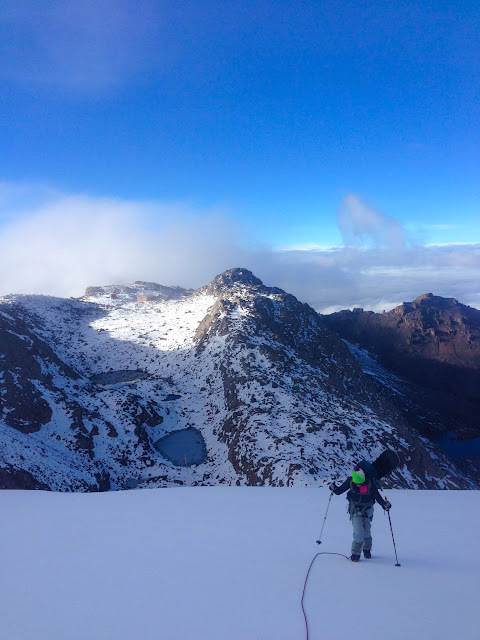 Kenya Trip: Summit for Our Sisters aka SKIING IN AFRICA! So it was Tuesday morning, and the final leg of the Kenya trip was upon us. 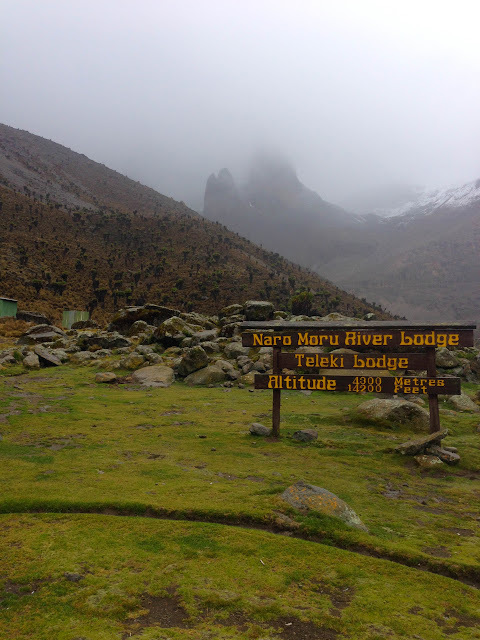 We’d depart for Naro Moru, a town at the base of Mt. Kenya, at 11 AM to meet with the Mt. 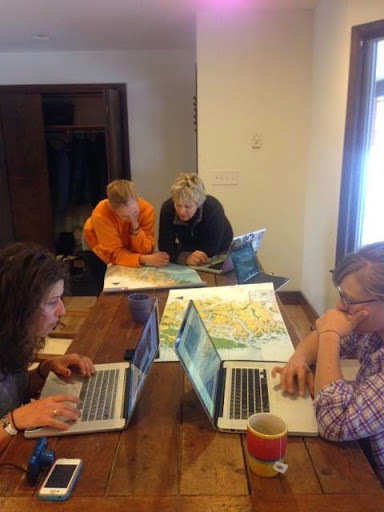 Kenya Guide and Porter Association and hatch a plan for our trip up Mt. Kenya. Kelvin gave us a lift in a car he borrowed for the occasion to fit our skis and snowboards. 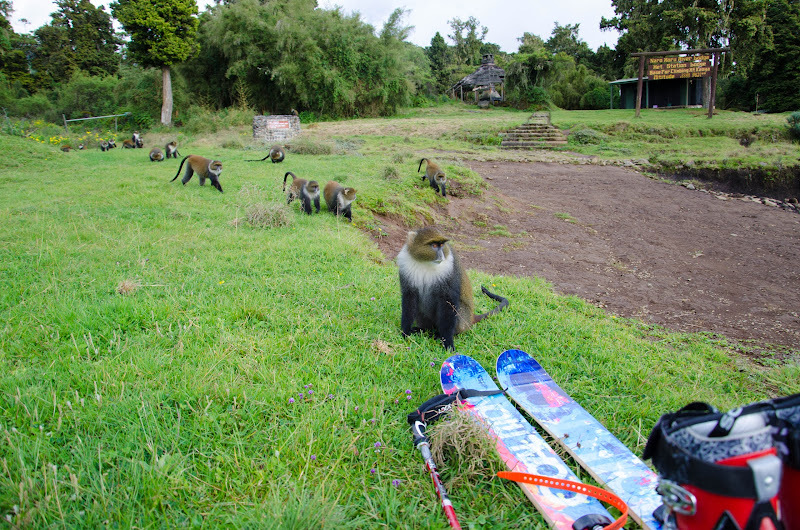 He’d never seen skis and snowboards in person and he’d never been to Naro Moru, so it was fun for all of us. En route in Kelvin’s ski carrying machine! 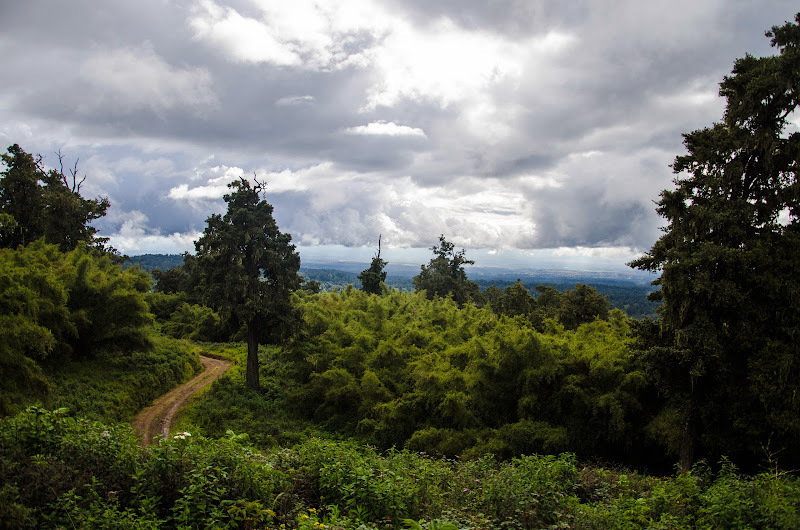 We met with the head guide Matthew and decided to ascend via the Naro Moru route since the weather this time of year is unpredictable and usually not great. We were here during the “light rainy” season and the rains had come a few weeks late and basically showed up for the start of our trip. The association put us up in super nice “bandas” complete with a fire place and we were to depart the next morning. Really nice accommodations at the Mt. Kenya Guides Association. 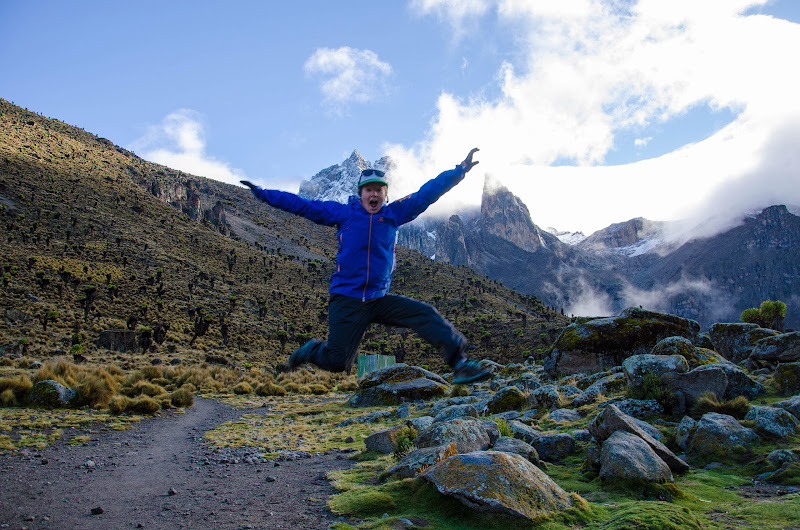 The next morning we met our guide Simon and some of our porters and loaded into a private matatu to the gate of Mt. Kenya National Park. 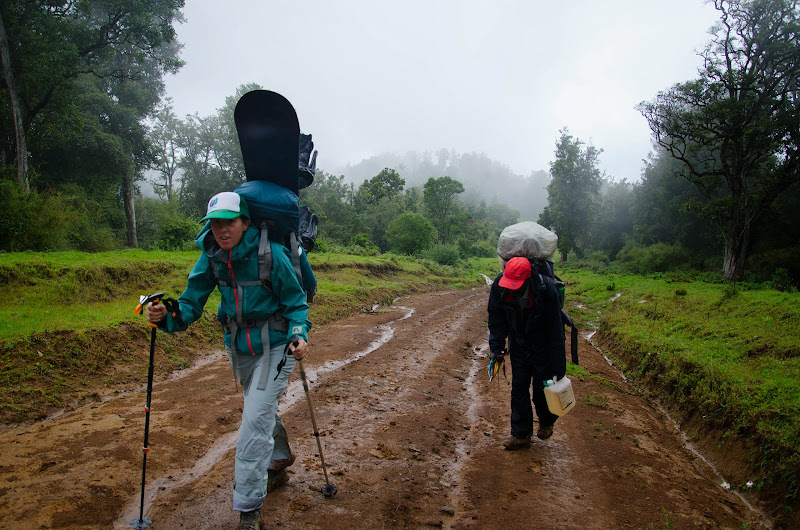 We picked up porters and sometimes just their backpacks along the way. It was pouring rain. Dropped at the entrance, we paid our park fees and did some last minute gear rearrangements and were off. 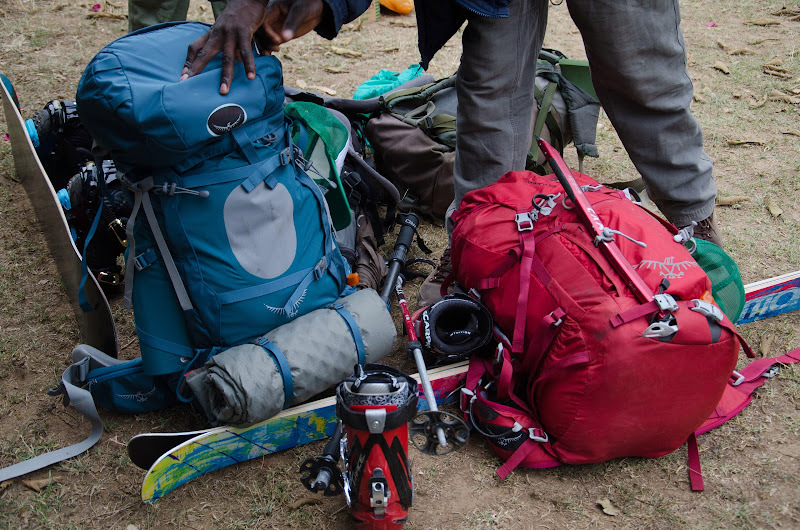 Bags and skis ready to be loaded into the matatu. The first 10 km were up a rough dirt road to the Met (meteorological) station were we’d camp at 10,000 feet for the night. The high clay content combined with constant rain made the road slick. We were in a bamboo forest and spotted monkeys and water buck from time to time. There was evidence of elephants, but we didn’t see any. Half way through, the rain subsided and we were able to enjoy the last few kilometers. Day one was in the books the only thing left to do was to set up camp and watch monkeys scarf down flowers. A rainy start to the hike. Starting to clear up and the views are getting better! My pants and shoes would remain this way the rest of the trip. My shoes would remain in Kenya. It rained all night and I dreamt that I was sleeping in water. Luckily, the Black Diamond Mega Mid held up and we emerged dry the next morning. After assessing the state of our tent and talking to the caretakers at Met Station about the weather up higher, we decided to leave our tent behind and utilize the hut accommodations the rest of the trip. Our next destination was McKinders, 10 km away and 4000 ft higher. 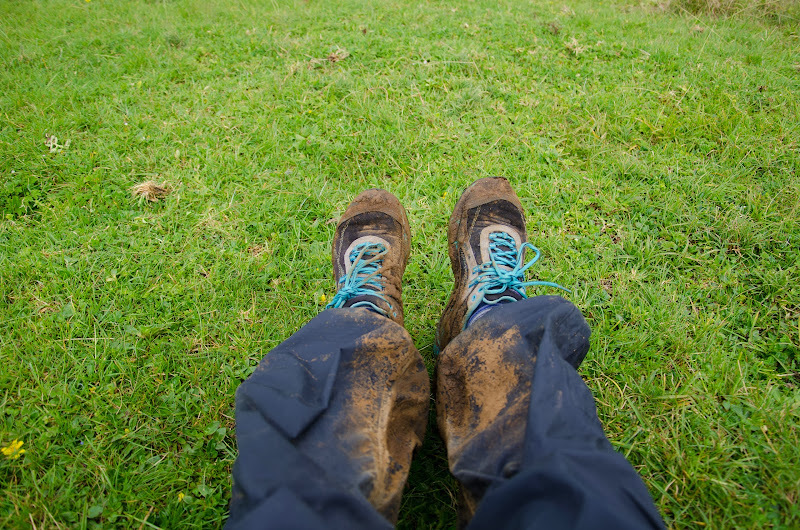 Part of the hike would be through a section called “the vertical bog” which would live up to its name – spongy, wet, green, steep, and rain from above continually adding to the moisture. I was in great spirits the first 3 hrs of the hike, but as the constant rain started to seep through my Gore-tex jacket, I started to unravel mentally and asked the guide if we could pick up the pace. He declined and so for self-preservation, I charged ahead and made it to McKinders within the hour. Just past “the vertical bog” – just a bog at this point! One of the 3 types of riberia on Mt. Kenya collecting water like it’s designed to do. I was trying to smile for this selfie. Behind me is the first glimpse of snow on Mt. Kenya. When I saw this sign, I just said out loud “happy” even though no one was around. Looking out the window at Mt. 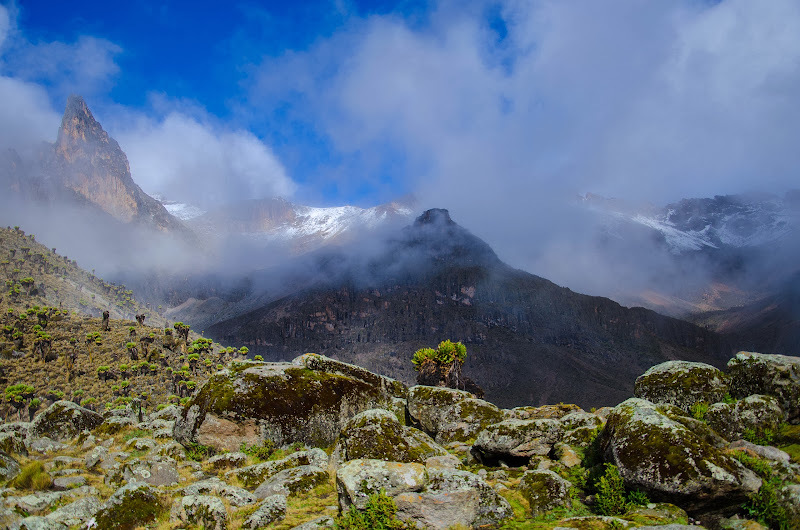 Kenya’s peaks from McKinders Hut. It wants to clear up! We spent the afternoon drying off the best we could, drinking tea, chatting with some French guys, and resting at McKinders. Around 3 in the afternoon, the clouds broke and I had my first real glimpse of Mt. Kenya. I could finally see why I was here. I’d been questioning it before. Yeah, it’s pretty beautiful here when the sun is out. The next morning we headed up to the Austrian Hut and on the way, I crossed the 14,505 ft elevation mark, so I was now officially as high as I’d ever been. 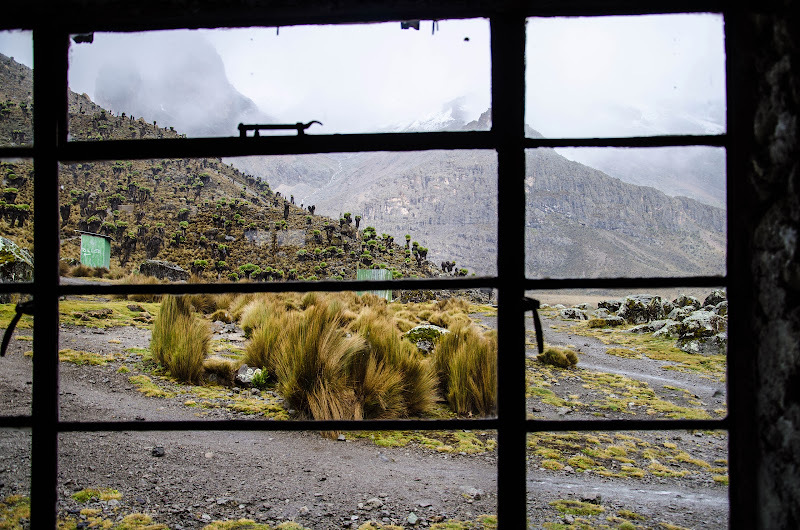 I was feeling the altitude and had not slept well the night before, but I was able to keep a steady pace and make it to the hut for rest and lunch. I spent a few hours resting in my sleeping bag waiting for my headache to subside and the weather to clear before making a push to the summit. At 3 pm I suggested we try for the summit with the anecdotal evidence that it cleared up around 4 pm the previous day. Simon and Jen were game and so we started the somewhat quick hike from 15,700 feet to 16,322 feet. The 40 minute hike was fun. 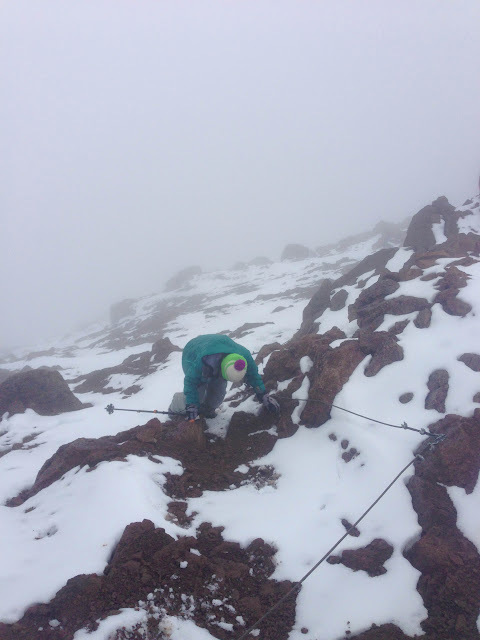 There was a few inches of new snow on the ground, fun rock moves, moderate exposure, and some rebar ladders. We reached the top quickly and it was still socked in. We took some photos and hung out for a while when we saw a patch of blue make an appearance. Little by little, the skies cleared and we were treated to some views of the surrounding peaks and glaciers. I excitedly proclaimed that we might get to ski tonight! So we headed back down to scope out our access to the glacier. Me at Point Lenana with clear skis moving in! My backseat meteorology turned out to be correct. Watch out NOAA! By the time we made it back to the Austrian Hut, the clear skies were gone, but the visibility was good enough to get a good look at the glacier. There were a lot more “cracks” visible than I anticipated. We had heard reports ranging from no crevasses to one obvious crevasse to an unknown amount of crevasses. We had also heard that the glacier surface would be anything from old ice to deep, wet snow. From my vantage it looked like it had multiple cracks and wet unconsolidated snow on top of ice. There was even evidence of a new slide. I was hoping the wet snow would freeze overnight and therefore stabilize and bridge some of the cracks. The lookers left side of the glacier was a longer run, but had less new snow and more cracks, were the lookers right seemed smoother, safer, and, overall, like a good starting point for the morning. We confirmed this information with the ranger who lives at the Austrian Hut. He said that the first snow Mt. Kenya received this year started 2 days ago and that due to the long dry spell, many cracks did open up. The glacier definitely looked a lot different than the conditions described to us during this expedition last year and it looked incredibly different from the shots in the Warren Miller movie filmed at least 10 years ago. We knew the glacier was receding, but I couldn’t help but feel like we’d be one of the last people to ski on snow this close to the equator. We decided to wake up early in the morning and climb the right side roped up and reassess from there. The morning came and it was clear so we got our stuff together as quickly as possible and made the 10 minute walk to the glacier. We roped up and started climbing. The snow had frozen overnight as I hoped and was perfect for climbing. The surface was not bulletproof and so crampons held well which boded well for skis and snowboards. 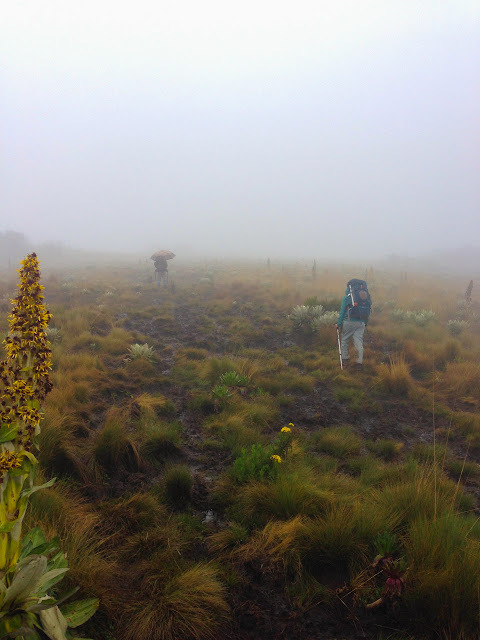 When we reached the top, the clouds rolled in again so as we started our descent, we were in a white cloud. It induced a bit of vertigo, but I was able to use rocks and some bamboo poles (placed for a glacier study) to make efficient turns down the glacier. It was like a storm day above treeline where you use anything dark to gain perspective. At the bottom of the run, I thought about hiking back up, but the visibility kept degrading and that would be my only run in Africa, this time! Jen making her way up the Lewis Glacier with clear skies in the background. Not so clear for skiing, but skiing was still super fun! After high fives to each other and our guide Simon who was waiting at the bottom, we returned to the Austrian Hut and showed photos to our cook and porters. I think they were impressed, but they were also happy to be heading back down to McKinders to a warmer and dryer environment. So we packed up the rest of our stuff and ran down there just beating the late morning rain! It rained the rest of the day, so instead of heading down, we just relaxed at McKinders and were to descend the final 10 km the next morning. 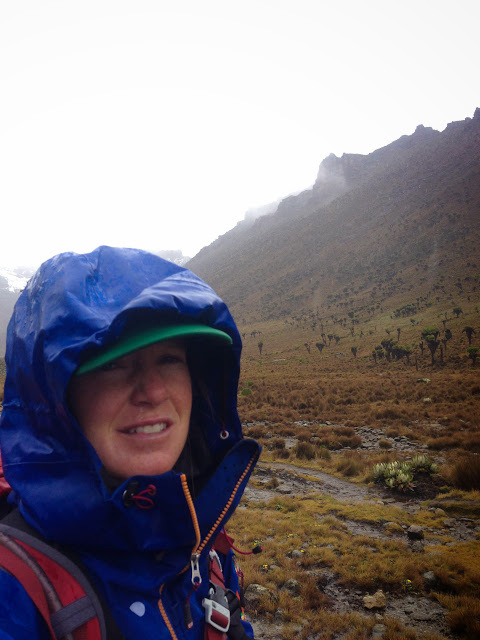 We awoke to clear skies again and started our descent and sure enough it started to rain again at about 11 am! We were all but down at that point. We just had a scary 4 wheel drive down a dirt road to town. Amazingly, it hadn’t rained Naro Moru all weekend and the dry lawn and warm sun felt amazing… as did a shower and soap. We had done it! We climbed Mt. 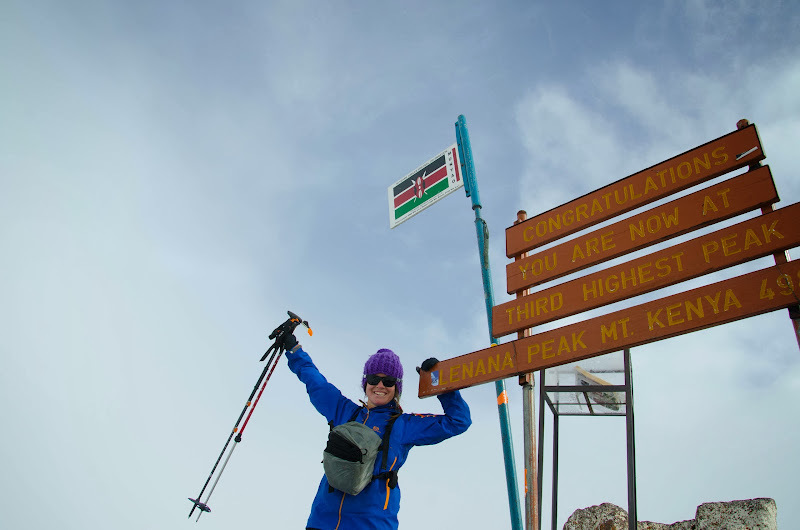 Kenya, skied Lewis Glacier, and summitted for our sisters. The campaign is running for 2 more weeks so go here if you want to donate and support Zawadisha’s work in Kenya! Quick shout out to all my supporters: Elevenate for gear that kept me dryer than everyone else, Osprey for the best ski mountaineering pack on the market, Natures Bakery and Tahoe Trail Bar for delicious snacks to fuel our bodies, Kirkwood Mountain Resort for the training ground, and Kind Design for stylish tshirts and gloves. It’s clear again! Need at least one jumping photo! 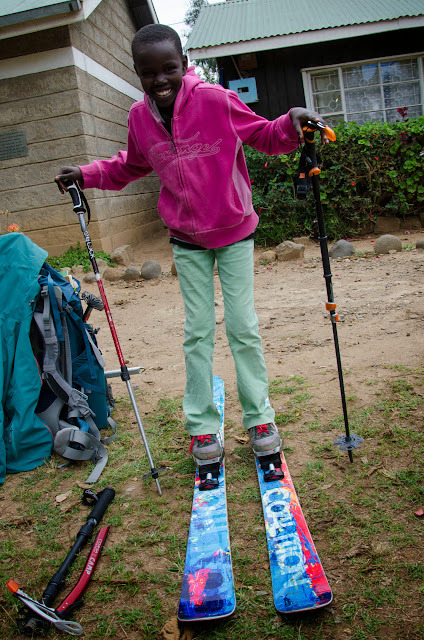 There was no snow or rain in town, but my new friend Maureen wanted to try out the skis! 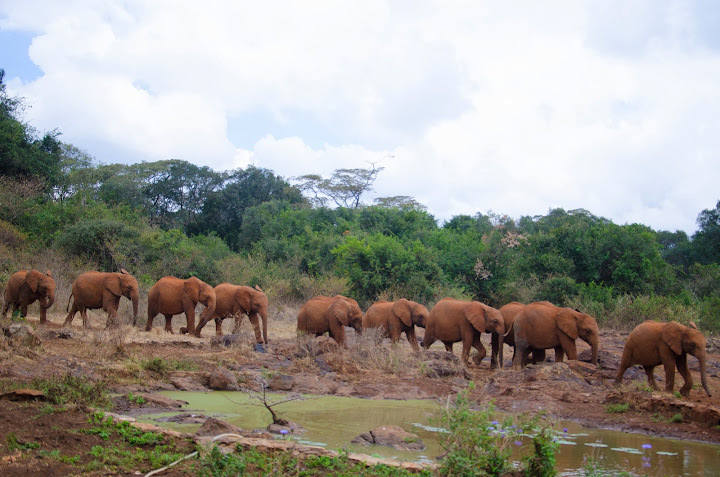 Kenya Trip: Giraffes, Elephants, and Shopping! After Kilgoris, we had a day in Nairobi before we left for Mt. Kenya. 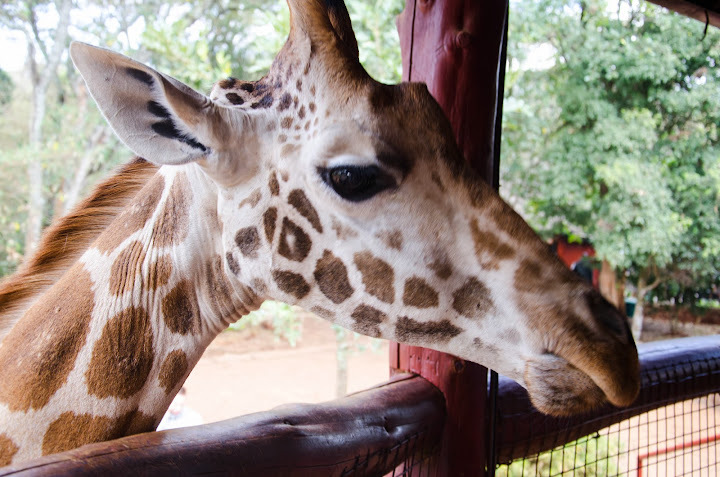 I had fond memories of visiting giraffes at the Giraffe Center in Langata, a suburb of Nairobi, so I decided to arrange another visit there. 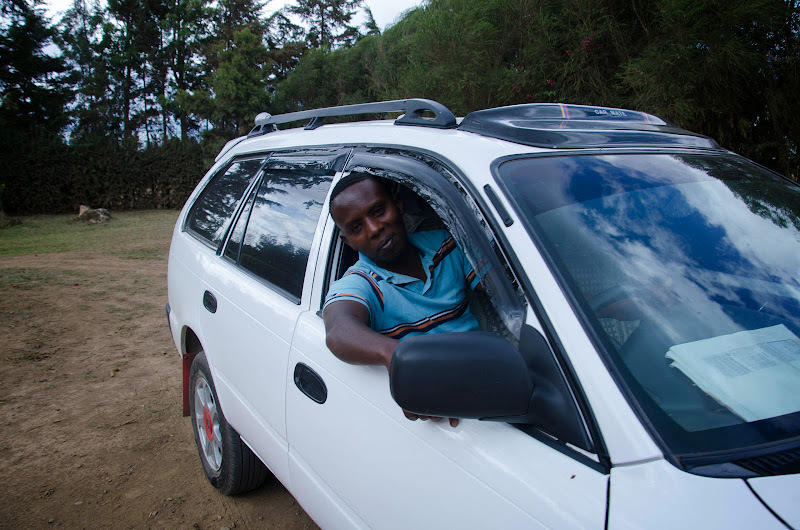 I hit up Kelvin our driver and he picked me up from the Sarit Centre Mall where the Zawadisha crew was doing work. 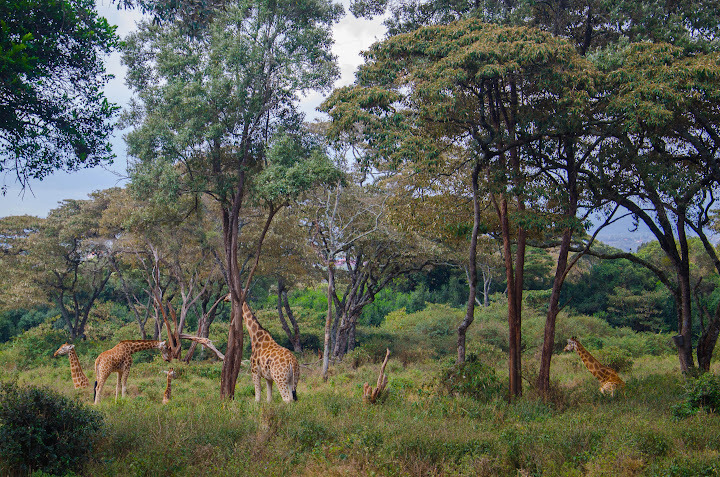 Langata and Karin are these peaceful, somewhat bucolic areas of Nairobi bordering Nairobi National Park. Walking into the Giraffe Center, I met Ed and fed him some pellets gave him some pets. Ed’s eye. 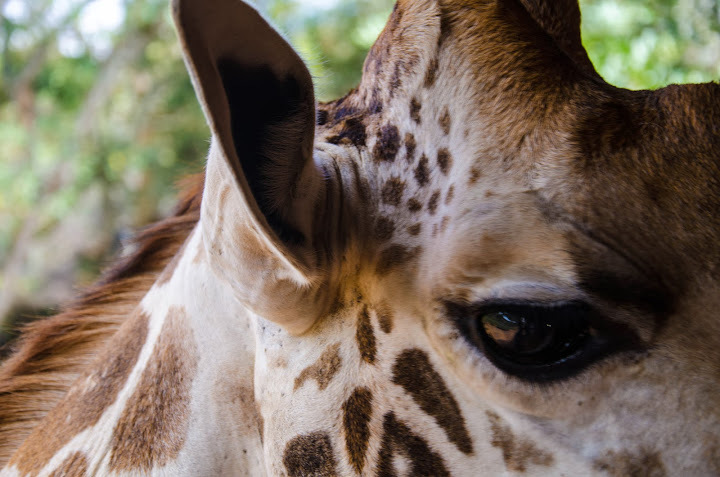 Giraffes have huge heads and eyes… and great eyeliner! 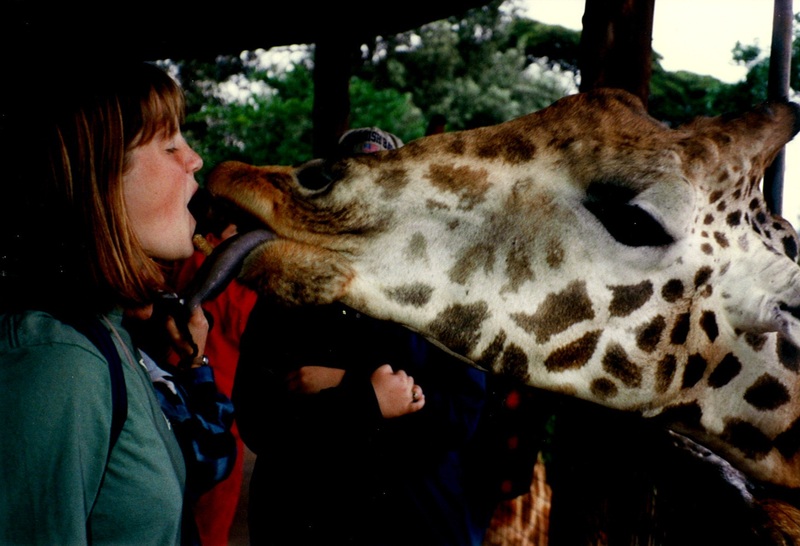 My adulthood visit to the giraffes. I’m not sure I’ve changed, at all! 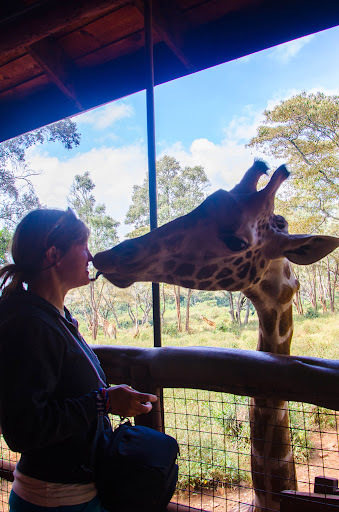 Since I was one of the only people there, I was able to spend quality time with the giraffes and then leave by 10:30 to head over the Elephant Orphanage. 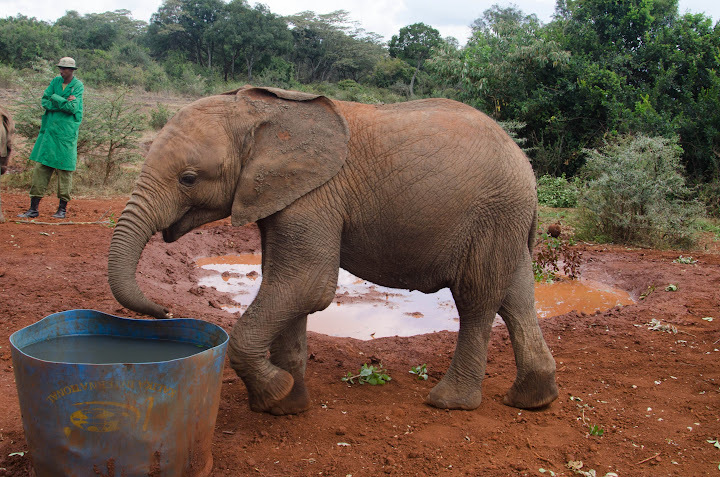 David Sheldrick Elephant Orphanage has daily programs from 11 to 12 PM where you can meet all the orphans, ranging from 3 months to 2 years old and hear all their stories. You can even touch them and watch then drink out of bottles and eat. It is cuteness overload the best $6 I spent! Additionally, it is for a great cause. 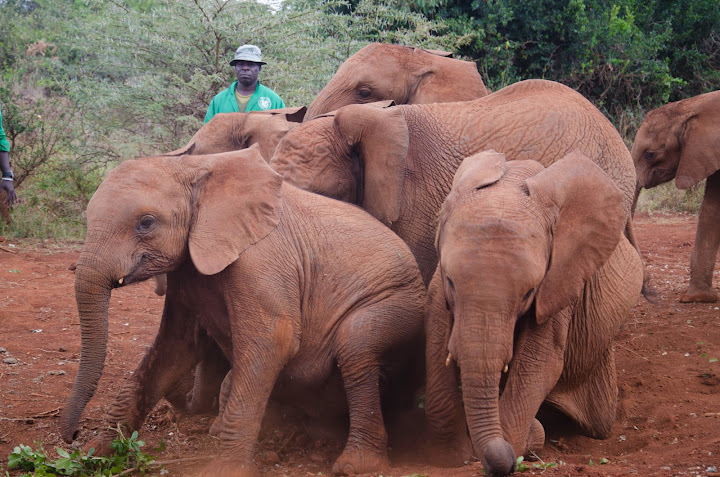 Most of these orphans are so because of poaching. Elephants live to be 70 years old, have 6 sets of teeth in their lifetime, and really do have an amazing memory. 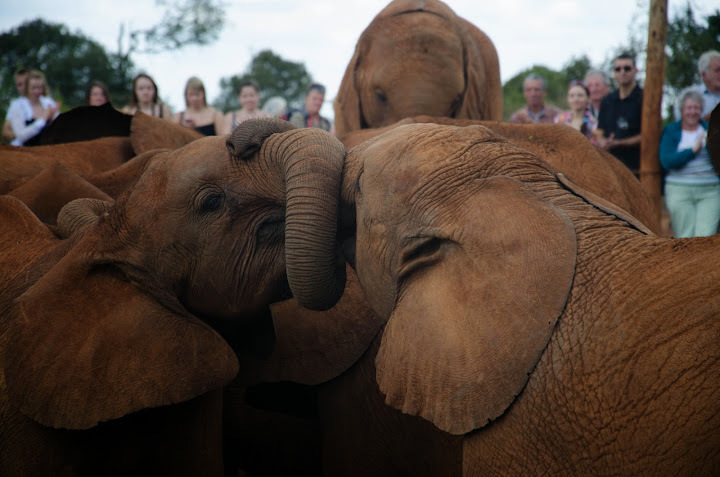 After the elephants are released into Tsavo National Park, there are stories of them remembering their caretakers 30 years later! A group of the orphans coming out to visit. Just some elephants doing a secret handshake. After an amazing morning visiting animals, Kelvin and I picked up the others and headed over to Amani Ya Juu for lunch and shopping. Amani Ya Juu means “higher peace” in Swahili. It’s a fair trade sewing and economic development program for marginalized women in Africa and was started by displaced women sewing placemats. They have an incredibly beautiful selection of handmade household items, baby stuff, women’s clothing, and bags. We met with an Amani worker Maggie, who also receives a Zawadisha loan and had lunch and then Judi and I went to town shopping for Christmas gifts. It’s always nice to be able to buy unique gifts that support empowerment. You should shop there now! 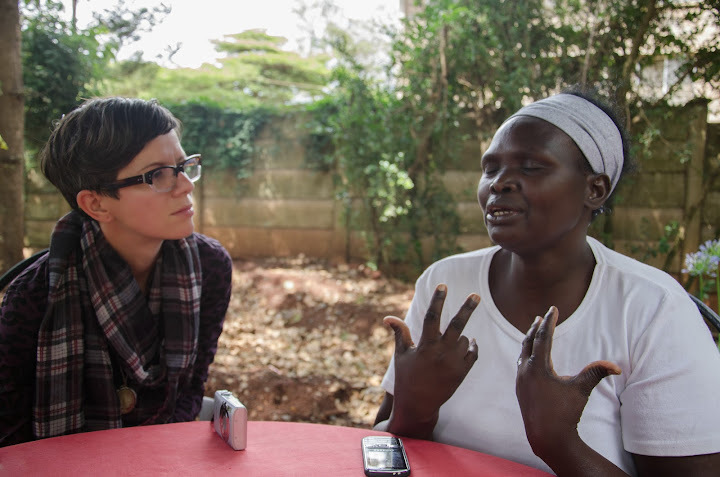 Maggie explains Amani Ya Juu’s story to Judi. Judi looks smart. We finished the evening with some Ethiopian Food at a restaurant popular with Nairobi’s many NGO workers. Nairobi has quite a few gems and I was happy to have the day to see quite a few of them. The hardest part is navigating the “public” transportation and traffic!